As an active member of World Wide Koi Club’s (WWKC) Koiphen Forum, Nancy started reporting her observations on her water quality and plant growth as she dosed Nualgi. We are very pleased to receive feedback from an experienced pond owner as we follow Nancy’s journey for a healthier and a more balanced ecosystem. “I put my third dose in this morning. My pond water has now turned a tannin color from the Oak tree pollen. It does this every year. It was clear a few days ago. I will know if the Nualgi is working once my water clears again. June 19, 2015 – My Lotus Bloomed! Nancy responded: “I have had problems, a few times a year, with string algae since the UV doesn’t help with it. Over the years when the string algae started to grow, I would start adding Koi clay and within 24 hours the string algae would disappear. Since using Nualgi, I have not had any problems this summer at all with it. No green water at all. 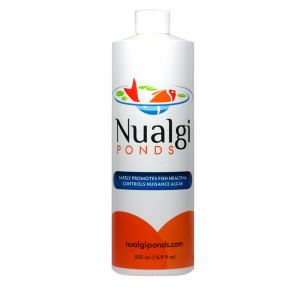 In Nualgi’s info, it reads that it is good for all plants in your pond. I have had more water lily blooms this year than I have had for a long time. What is cost to dose a 6000 gallon pond ??? can water plants still be given fertilizer tablets when using nualgi? Absolutely, when fertilizer is applied correctly there is no interaction with the pond water. For example when adding tablet fertilizer to a potted plant, you push the tablet into the soil and push the soil back over the hole to prevent the fertilizer from releasing into the water. Regardless there is no harmful interaction between the two. The longer you use Nualgi there will be a noticeable difference in overall plant health and a decrease in the need for added fertilizer. Nualgi compliments every part of the water garden ecosystem.